On May 4, the 3rd game of 24th Asahi Open Championship between Asahi Habu and Challenger Fujii 9dan was held in Osaka-fu, Japan. 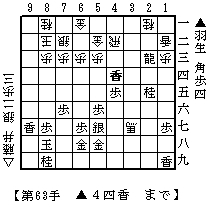 Habu played Sente(made a first move, lower side of the diagram) and won the game with 63 moves. The score after the game is 2-1 lead by Habu. Since this is a 3 wins match, Habu needs to gain one more win to defend the title. Here is the resignation diagram in the left. I'm sure many people is curious why Fujii resigned in this early stage when there seemed to be no immediate mate. Let me try to explain. It is a position when Habu dropped his Lance on 4d to threat to take Gote's rook. It's a still in the middlegame. It's a good idea to see which side had material profit and loss in the middlegame to judge which side is in advantage. Sente had 3 lances while Gote had 3 silvers(one on board and two in hand). That showed Gote had material advantage by trading a lance for a silver. Then why Gote resigned? In addition, Sente can attack Gote's king directly by B*9a and L-9b+ in the diagram. So it is the hopeless position to Gote since Gote's King would be attacked easily by B*9a and loss of Rook would be highly expected. I think that's why Fujii resigned this ealry. http://www.insurance-top.com/company/ auto site insurance. [URL=http://www.insurance-top.com]home insurance[/URL]: The autos insurance company, compare car insurance, auto insurance. [url=http://www.insurance-top.com]cars insurance[/url] from website .